My husband and I both wanted an Italian wedding. He grew up in Italy and I love most everything about Italy. Soooo that was that. 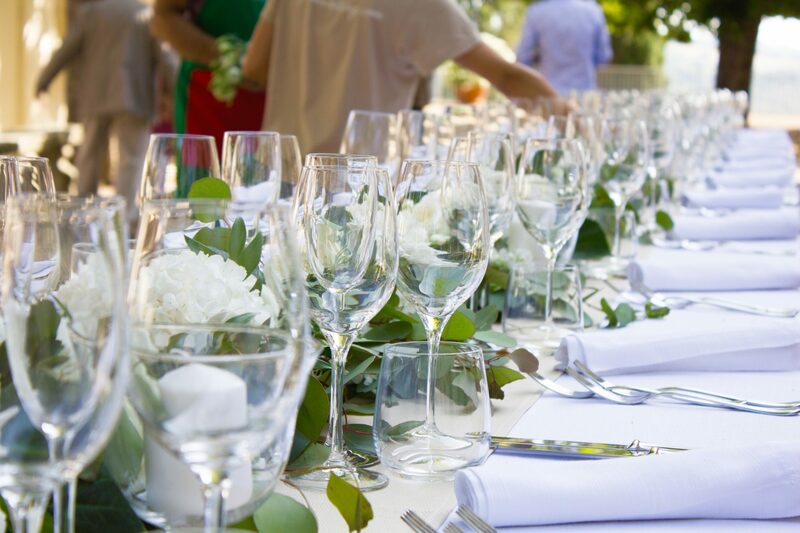 The theme for our wedding would be family, friends, food, wine. 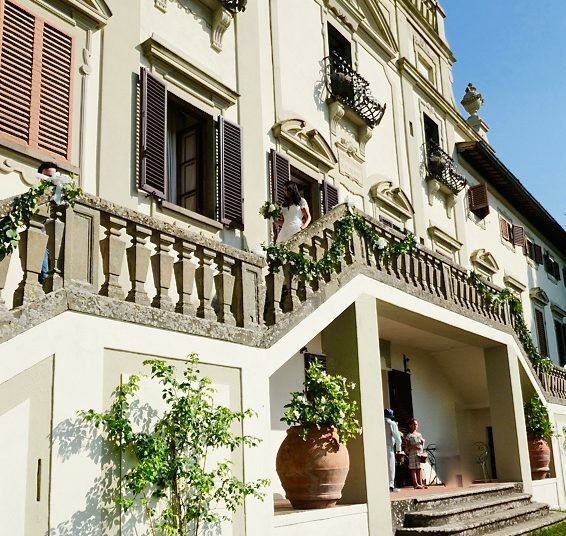 Plus the gorgeous Italian countryside wonderfully showcased at the wedding venue, Villa Vistarenni, and our sincere love for each of these things. That’s it. No registry, no bridal this, no groomsmen that. Like Italian food, divine and perfect in quality and simplicity. The words “getting married in Italy” illicit so much imagery for me. 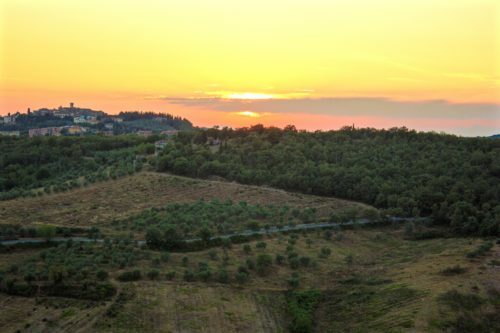 Vineyards, wine, rows of cyprus trees, old villas, rolling hills and sunsets. 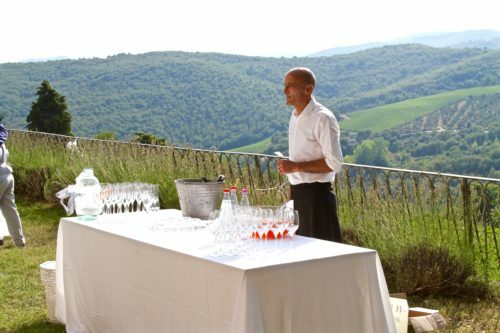 A Tuscan wedding at a villa in Chianti was what I wanted. Family and friends would fly in from all over the world to spend four nights with us at the picturesque, 17th century Villa Vistarenni. This was not my first time getting married. Exit the page if the urge to pass judgment creeps up. I had a four day destination wedding in Bali filled with events and formalities and people I hadn’t seen in years. It sounds lovely and it was lovely. But I get exhausted just thinking back to the months and months of planning that went into it. And for what? We’re not married anymore. The planning for our Italian wedding took about 6 weeks. The guest list? 25 people. The paperwork for the wedding? Not so simple. More on that below. 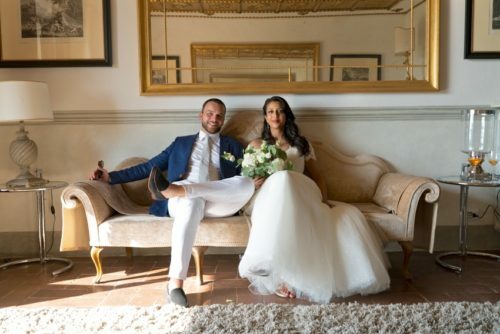 Read The Perfect Tuscan Winery to see what we did after the wedding. 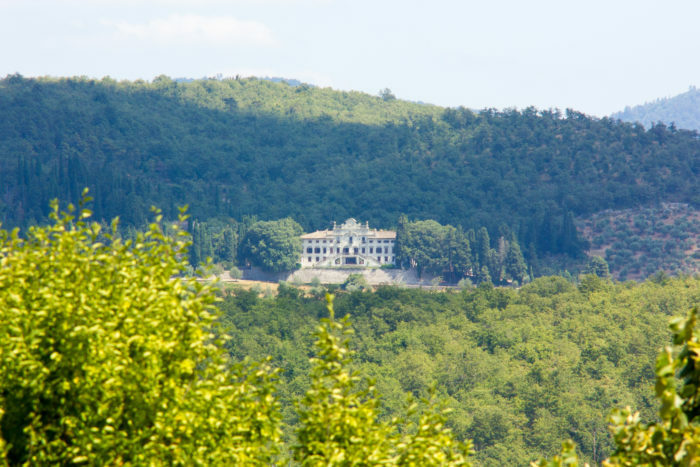 Villa Vistarenni is ideal. I only came to learn of it through Google images once I plugged in the search for Tuscany wedding. A blog, go figure, further revealed to me more of the details. Set deep into the woods an hour outside of Florence in Radda, Chianti, I had a feeling and booked the villa without a visit. There was something about those double staircases cascading down the rear of the villa overlooking the countryside. We rented out the 16 room villa and accompanying cottage for a few days. Everyone had their own room. Villa Vistarenni has tennis courts, a swimming pool and produce their own wine. We finished a case of their wine the manager so generously left for us that first evening. I also appreciated the upkeep and modern yet old world feel of the villa interiors. Many villas in the countryside are incredibly charming. But when looking at the interiors, pay careful attention if you plan on staying overnight. An ideal backdrop for our Italian wedding. Now this is an important one. Italian cuisine needs to be showcased in all its glory. A slight hiccup is that we had guests with a bevy of nutritional and religious requirements. Some didn’t eat gluten, others no pork and a couple were vegetarian. 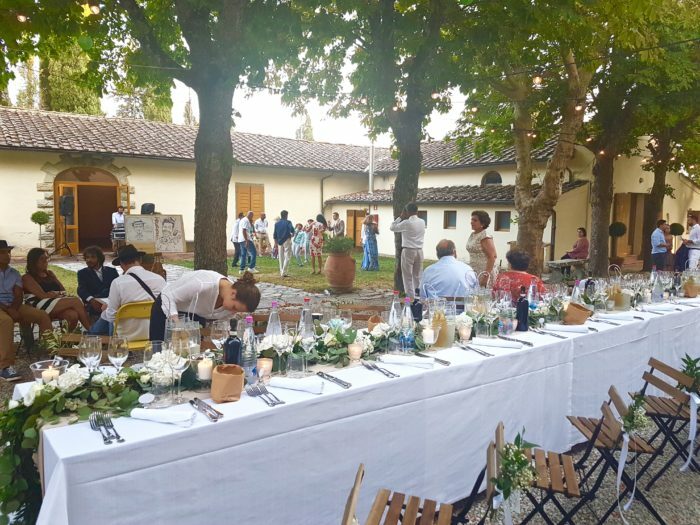 After careful consideration and a food tasting, catering from a restaurant in the greater Siena area known as Asinello turned out to be a fantastic choice. 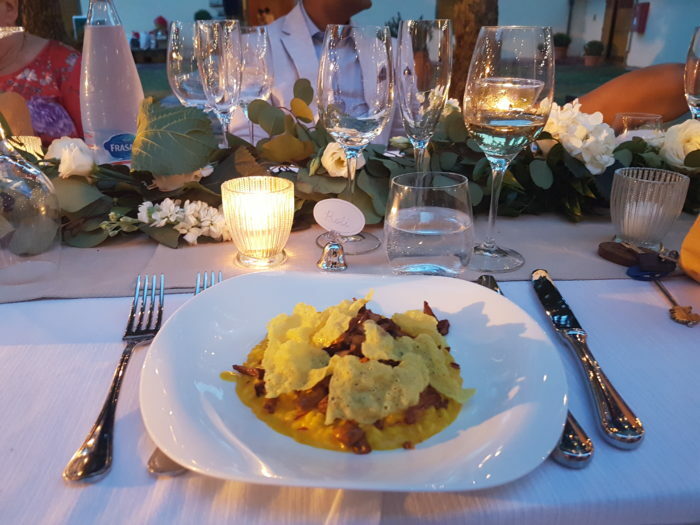 They obliged all our requests and everyone experienced the delights of seasonal Tuscan fare. Asinello supplied us with fantastic wines for the evening and the best Chantilly cream cake I ever tasted. Ever. All documents originating outside of Italy must be translated. Authenticate them at the nearest Italian Consulate having jurisdiction over the place of issuance in the U.S.
Dichiarazione Giurata aka Certificate of No Impediment, A declaration required by Italian law which states that “there are no impediments,” or that one is free to marry, according to the laws of the State of which the citizen is a resident. Banns are posted once you file the Declaration of Intention to Marry. Please visit Americans Getting Married in Italy for more info. Hope you found “My Italian Wedding in Tuscany” fun and informative. Feel free to leave any comments or questions in the section below.